Edgars Sumskis strode to a convincing win in the Cambridgeshire Cross-Country Championships at St Neots on Sunday. And in so doing he became the first Nene Valley Harrier to have his name carved on the trophy since the 1990s when Giovanni Rizzo won it four times and Ray Church won it once. The victorious Nene Valley Harriers Under 11 girls team of Matilda Halford, Evie Hemmings and Alexandra Braid. On a semi-frozen Priory Park course, the rangy Latvian broke from the leading group well before halfway and never looked back as he rapidly pulled away from runner-up Chris Darling of Cambridge and Coleridge AC. Sumskis, a specialist steeplechaser who hopes to represent his country at this year’s European Track & Field Championships, said after the race: “I decided to make my move early on as I could hear other runners in the group breathing heavily and I wanted to make sure it didn’t come down to a sprint finish. Former Nene Valley Harrier Alex Hampson, now running in the colours of Cambridge and Coleridge, finished third with Peterborough Athletic Club’s Steve Robinson one place further back. The Peterborough Athletic Club senior men's team. Robinson, who was recovering from illness, led PAC to team silver and the club also won veteran team gold. Shaun Walton in eighth, and 10th-placed James Whitehead provided Robinson with sterling support, and not far behind came clubmates Amittai Ben-Israel (12th), Phil Martin (15th) and Kirk Brawn (22nd). Brawn won the silver medal in the Over40 category and led home the gold medal winning team. He was ably assisted by Jon Peet in 30th and Simon Mead, who is recovering from injury, in 31st place. PAC team manager Elaine Larkins said: “I’m so proud of all of the guys. We knew it was going to be tough to win the gold medal with the numbers that Cambridge & Coleridge have to call on so, to win silver consolidates what a great squad there is building at Peterborough. Nene Valley athletes picked up plenty of prizes with the all-conquering Under 17 girls team winning gold as Josie Fortune and Ellie Piccaver claimed the individual silver and bronze medals respectively and Amber Park finished fifth. The Nene Valley Under 11 girls team also claimed the gold with Matilda Halford having a fine run to take the individual bronze, just ahead of fourth-placed Evie Hemmings. Alexandra Braid completed the scoring team finishing 11th. The older of the Hemmings sisters, Lottie, won Under 13 bronze, but also picked up team silver with Chelsea Bole in fourth and 13th placed Amelia Devine both running well. PAC’s Chloe Finlay (5th) and Sarah Caskey (8th) led the senior ladies to bronze. Emma Randall was the first Harrier home in 11th place. Nene Valley Harrier Katie Tasker was the first local in the Under 15 girls race finishing fourth. The Harriers boys did not fare as well as the girls, and it was William Tee of Yaxley Runners who led the Peterborough challenge in the boys Under 11 race with a 13th place finish. The Nene Valley Under 13 boys finished fourth overall with 11th-placed Sam Oakley leading the charge behind 10 Cambridge and Coleridge youngsters. Kai Chilvers came eighth in the boys Under 15 race and Ben Roberts in seventh was the first Under 17 Harrier home. Ramsey Runners had one medallist with Tom Waterworth claiming the bronze in the Under 11 boys race. Maggie Skinner, a new PAC signing, won the women’s veterans title at Boston. The former Stamford Strider is in fine form having given birth to a daughter less than three months ago. 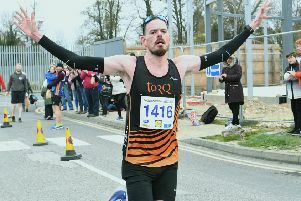 Ben Heron, from Spalding, was first PAC man home in the senior men’s race finishing a creditable fourth despite losing a shoe in the closing stages when chasing a bronze medal. Next home was Simon Fell in eighth position. Heron’s daughter Jasmine made the Lincs team for the inter-counties championships with a good run in the Under 13 girls race. Wendy Perkins (veteran women) and her daughter Faith (Under 11) were both sixth.